La Llorona. The Weeping Woman. A horrifying apparition, caught between Heaven and Hell, trapped in a terrible fate sealed by her own hand. The mere mention of her name has struck terror around the world for generations. In life, she drowned herchildren in a jealous rage, throwing herself in the churning river after them as she wept in pain. Now her tears are eternal. They are lethal, and those who hear her death call in the night are doomed. 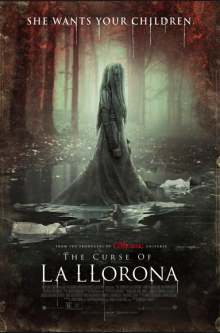 La Llorona creeps in the shadows and preys on the children, desperate to replace her own. As the centuries have passed, her desire has grown more voracious…and her methods more terrifying. In 1970s Los Angeles, La Llorona is stalking the night—and the children. Ignoring the eerie warning of a troubled mother suspected of child endangerment, a social worker and her own small kids are soon drawn into a frightening supernatural realm. Their only hope to survive La Llorona’s deadly wrath may be a disillusioned priest and the mysticism he practices to keep evil at bay, on the fringes where fear and faith collide. Beware of her chilling wail…she will stop at nothing to lure you into the gloom. Because there is no peace for her anguish. There is no mercy for her soul. And there is no escape from the curse of La Llorona. On April 19, 2019, this timeless Hispanic legend comes to terrifying life in New Line Cinema’s “The Curse of La Llorona.” The film is produced by James Wan (“The Conjuring” universe), Gary Dauberman (“IT” and “Annabelle” franchises) and Emile Gladstone. Michael Chaves, who won Shriekfest’s Best Super Short Film in 2016 for “The Maiden,” makes his feature directorial debut. The film stars Linda Cardellini (Netflix’s “Bloodline,” “Avengers: Age of Ultron,”); Raymond Cruz (TV’s “Major Crimes”); and Patricia Velasquez (TV’s “The L Word,” “The Mummy” films). The cast also includes Marisol Ramirez (TV’s “NCIS: Los Angeles”); Sean Patrick Thomas (the “Barbershop” films, “Halloween: Resurrection”), Jaynee-Lynne Kinchen (“Selfless”) and newcomer Roman Christou. Richard Brener, Dave Neustadter, Walter Hamada, Michelle Morrissey and Michael Clear are the executive producers. The film is written by Mikki Daughtry & Tobias Iaconis. Chaves’ behind-the-scenes team includes director of photography Michael Burgess, production designer Melanie Jones, editor Peter Gvozdas and costume designer Megan Spatz. The music is by Joseph Bishara (the “Annabelle” and “Conjuring” films). This film has been rated R for violence and terror. Join LatinoScoop at an exclusive advance screening of THE CURSE OF LA LLORONA in select locations below. Click on the city name below for your city and enter the code. If you download a screening pass and aren’t able to use it, please share it with someone who can attend. There is a limited number of passes available for each location. Screening passes are available on a first-come, first-serve basis. Additional passes will not be added once they are all redeemed. Anyone downloading a screening pass is advised to arrive early to secure seating. The theater is intentionally overbooked by the studio to ensure a full house. Plan accordingly to arrive at the theater with enough time. All advance screenings will take place on Tuesday, April 16.